Get the inside track on all the hot news regarding DeskShare products, new releases, special promotions and discounts. Subscribe to our DeskShare News. The Internet today contains a wealth of information. Avid Internet users visit many interesting websites and read many articles. Information and web pages make their way in to the favorite folder for later viewing. Over the course of time, re-visiting these bookmarks becomes a major task for users especially as the number of bookmarks grows. A better technique for users is to automatically receive information about updates to their favorite websites. Many websites have recognized this problem and have started providing information in a common format. RSS is a web content syndication format. It is a lightweight XML format designed for syndicating (distributing) information. 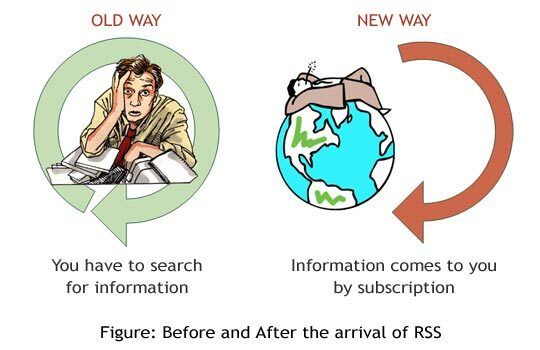 Although RSS was initially conceived as a format for syndicating news, anything that can be broken down into discrete items can be syndicated via RSS. Many websites publish content, which they would like to share with others. RSS provides a way for websites to distribute their content outside of a web browser. RSS is an easy way to keep you automatically up to date on websites you visit regularly. RSS files do not have a common file extension, although they frequently end in .XML, .RSS, or .RDF (note that other extensions may also be used). Internet users can employ special software, like newsreaders and RSS-aggregators, to organize RSS feeds and get automatic updates. Products like Active Web Reader allow you to read RSS files. Such types of programs go beyond simply reading. They also organize RSS feeds, manage updates, monitor website changes and search for information online. They can keep you automatically updated on the latest changes by checking RSS feeds and displaying items from them. RSS aggregators are set up to check for updates periodically from the feeds to which you subscribe, usually once every day. In other words, the information comes to you, rather than you having to go to the websites yourself. This saves a tremendous amount of time. In addition, you can read many more feeds in the same amount of time. Many people read several hundred feeds. That just would not be feasible without an RSS aggregator. Additionally, you avoid all the non-new information on a web page, including the ads, menus, etc. How to find RSS feeds for a website? Active Web Reader also provides a way to find RSS feeds automatically while browsing web pages through a feature called RSS Auto Discovery. The software provides a direct method to select discovered feeds and organize them. Active Web Reader also provides a way to find RSS feeds automatically while browsing web pages through a feature called RSS Auto Discovery. The software provides a direct method to select discovered feeds and organize them.